Slumping of Turkey’s international reputation does not seem to sober Erdogan as he continues an active intervention in the Syrian conflict, supporting radical nationalist and Islamist groups in the country and abroad and fights an undeclared war against Kurdish population of Turkey. The leading world powers—the US and Russia—identified Turkey as a country in a high-risk terrorism status, advising their citizens to refrain from traveling to this country. Washington even had to evacuate members of the families of American diplomats and soldiers stationed in Turkey. A formal warning says that southeastern provinces of Turkey (where Turkey continues punitive operations against the Kurds) as well as regions bordering on Syria are the areas with the highest risk. Leadership of the European Union frightened by a large influx of new migrants entering the Schengen Area and brutal acts of terrorism that struck France and Belgium had to make a deal with Erdogan. They promised to provide Ankara with a considerable financial aid to support migrants living in the refugee camps in Turkey provided that all illegal immigrants residing in Europe would return back. Once all illegal migrants leave the EU, it will officially admit Syrian refugees in the number equal to the number of deported illegal migrants. At first, experts thought of the deal as of something disadvantageous in terms of its implementation and benefit for Europe. Most of them regarded it as a mere Brussels’ concession to Erdogan’s provocations and threats. Today it is evident that Ankara’s direct interference in the Syrian civil war is among the major causes of mass exodus of Syrians from their country. Erdogan continues supporting armed opposition, radical Islamist groups like Daesh, Jabhat al-Nusra and armed gangs of Syrian Turkmen. The facts that Turkey supplies armaments, ammunition, explosives, uniforms, military equipment, food, medicines and transfers new militants-jihadists from Turkey to Syria, that Turkish citizens and power structures directly participate in combat operations in the northern Syria, that Turkish middlemen buy smuggled oil and museum artifacts from militants, and that Turkey has other relations and contacts with international terrorists are well-known and acknowledged by everybody, except Erdogan himself. Some time ago, representatives of Turkish security forces and Turkish journalists released some revealing evidence and were subjected to a persecution. In May 2015, American special forces destroyed Daesh ‘finance minister’ Abu Saleh and found evidence that Turkish intelligence agency MIT supported illicit transactions between Daesh and Turkish companies. Just recently reporters of the New Russia Today agency also released documents found in the city of al-Shaddadah freed from Islamists attesting that Turkish authorities and private individuals had traded oil and other commodities with terrorists. Documents include photos of militants taken first in Istanbul and then (of the same individuals, but holding weapons) in Syria. Captured militants confirmed close ties between Turkish authorities and Daesh. They claimed that Ankara was still cherishing hopes of derailing the Syrian peace talks, overthrowing the regime of Bashar al-Assad and suppressing the national movement of the Syrian Kurds with help of Daesh and similar groups. 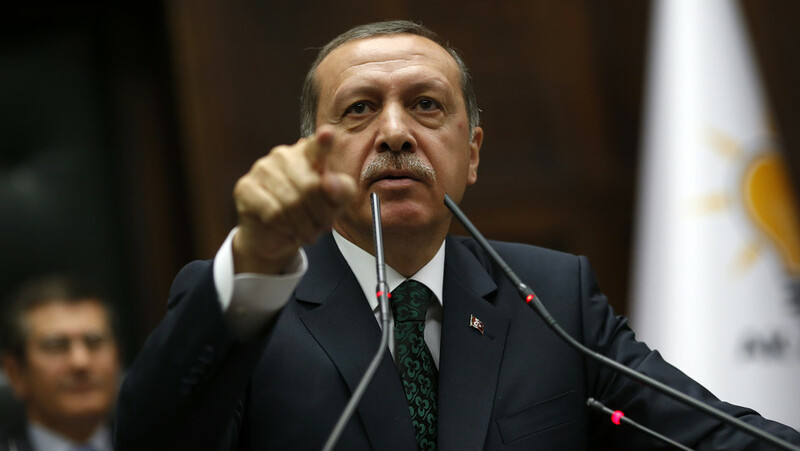 Erdogan masterfully exploits the problem of refugees and illegal migrants—the problem that surfaced not without his input. Millions of peaceful Syrian citizens were forced to flee for life to the neighboring countries (Turkey, Lebanon, Jordan, and Iraq) throughout the years of the civil unrest. Some of them later relocating from Turkey to Europe. Unlike other countries (for example, Lebanon—a small country with a population of 4.4 ml people that gave refuge to nearly 1.5 million Syrians), Turkey, a much larger country with a population of over 77 million people that provided shelter to only about 2.5 million Syrian refugees, immediately demanded from Brussels an urgent financial aid. Apparently, Turkish leadership is intending to keep wheedling big money out of Brussels threatening it to remove barriers restricting the flow of migrants infiltrated with Daesh militants. It was no accident that in January 2016, at a private meeting with American politicians dedicated to the problems of international security, King of Jordan Abdullah II (former Turkish ally) harshly criticized Ankara for contributing to the infiltration of terrorists to Europe and promoting the “radical Islam solution” for the Middle East. It is also the case that only about 75% of refugees currently staying in Turkey live in the refugee camps. The rest of them are spread through the country’s territory, and usually live in poverty on the outskirts of Turkish towns. As is known, Washington and Brussels initially declined Erdogan’s idea to create a buffer zone along the borderline with Syria where Turkish authorities could supervise the establishment of new refugee and displaced persons camps. The reason being—a significant portion of the Syrian-Turkish border is already controlled by the Syrian Kurds who proved to be a main military force opposing Daesh and Jabhat al-Nusra in these areas. As it turned out, however, the US was not interested in curbing the Kurd national movement in Syria because it deems the Kurds as its prospective ally in the future Syria. Stepping in the military actions of the Russian aerospace forces totally upset Erdogan’s plans to occupy at least a part of the Syrian territory. Nevertheless, Turkey launched a construction of several refugee camps with the total capacity of approximately 35 thousand people along the Turkish-Syrian border (on the 98-km-long section of the total 800+ km border) it still controlled, intending the camps predominantly for the refugees from Aleppo and the neighboring areas. This is how Turkish authorities are intending to cope with the new wave of refugees accumulated on the Syrian border. Director of Amnesty International’s Europe and Central Asia program John Dalhuisen report the facts of mass forced deportation of refugees from Turkey back to Syria. He said that in his opinion, it emphasizes “significant deficiencies in the previously reached agreement between Turkey and the EU.” The British newspaper The Times reported with reference to the Syrian Observatory for Human Rights that Turkish border patrol had repeatedly used firearms against Syrian refugees. At least 16 migrants, including children, attempting to cross Syrian-Turkish border, were killed in the last four months. Illegal migration of refugees from Syria and other countries via Turkey to Europe turned into one more branch of lucrative local shady business engaging Turkish authorities of various levels. At an earlier stage, they had developed and honed delivery routes and techniques for illegal trade in oil, drugs, armaments, ammunition, museum artifacts, and human organs. They developed and perfected a scheme of transfer of jihadists from other countries to Syria and Iraq “expanding” their “transfer program” with stops for rest and rehabilitation in Turkish medical facilities.